Trot-canter and walk-canter transitions have long been weak points for us. Mostly because I never developed the canter quality early on, and never prepared or rode the transitions in balance and self-carriage right at the start. 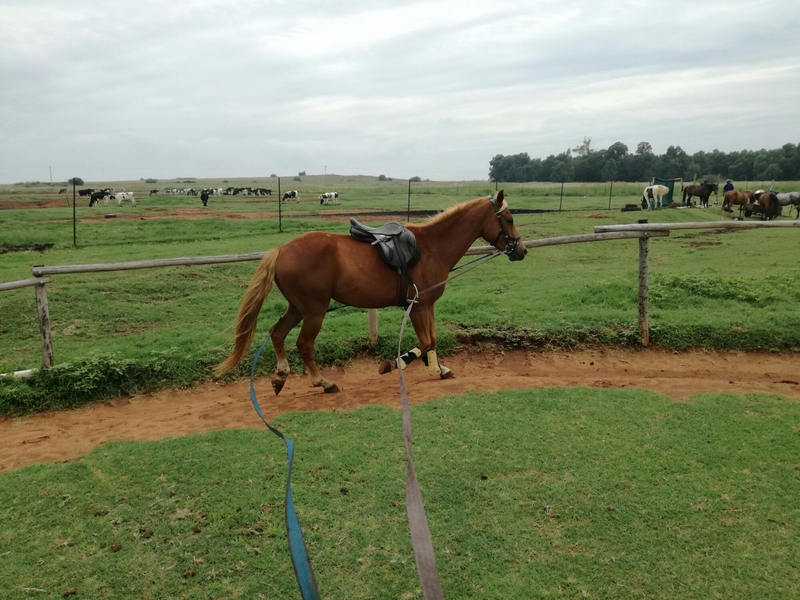 I learned to see a canter lead on this horse, and to get the one I wanted – which usually involved a lot of flailing about with my upper body and leaning forward while looking down to try and see the lead. This movement consistently scores low for us, with comment “hollow”. I was originally taught to throw my weight to the inside, to encourage the horse to pick up the inside lead. Top tip: this don’t work. 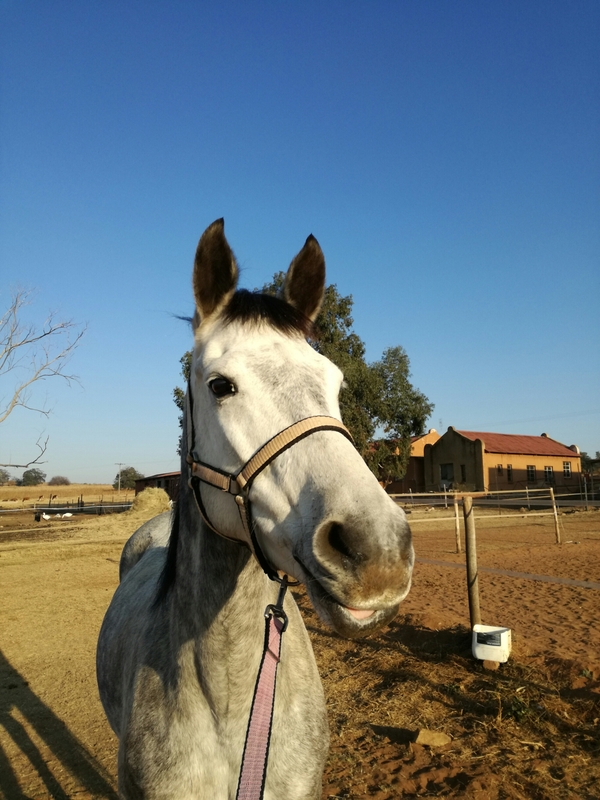 With me fooling about, and the trot lacking power, and the canter lacking engagement, Arwen learned to throw up her head and lunge into canter from the front. It’s obedient as they come; I can get it the first time, every time, without trot steps. I can get the correct lead 99% of the time (whether it’s canter or counter canter), even on the middle of the long side or wherever. Arwen anticipates the transition and starts to get tense and jogging in walk. I still want to throw my weight to the inside and curl up, especially in a simple change. Arwen gets really hollow and makes a laboured sort of bounce into the canter. Medium walk up the short side F-A. Change rein across the long diagonal in extended walk. Transition to canter at C.
The problem started as we transitioned back to medium walk at M. In the double bridle I tried adding a tiny bit of curb during the transition down, but that only made her more tense and caused her to jog and hollow instead of jog and lean. Her anticipating made me tense, too, so my seat was kind of all over the place. It was a hot mess. Sorry, Arwen. I found this exercise on the Internet, and during our next session we started trying it out. A turn up the centerline. L leg-yield to the track. Track straighten, then transition to canter. Canter to M, transition to walk. C turn up centerline and repeat. Right off the bat this started to work better for Arwen. Her walk leg-yields are supple and I can get them very steep (L-B for instance) so whenever she’d start rushing, instead of getting in her face, I’d increase the steepness of the leg-yield so that she had to focus on that instead of on getting all dragonish. With her flexed to the inside, I also didn’t worry as much about the lead, so that mitigated my flailing a bit. As we returned to the track she could start anticipating but then I’d put her in slight shoulder-fore for a few steps and then ask for the canter. This exercise took my mind off the anticipating and made me concentrate on the preparation – actively ending the leg-yield, keeping my upper body in line, going into shoulder-fore, half-halt, outside leg back, inside shoulder up, canter on. Arwen was rounder going up but added some trot steps. 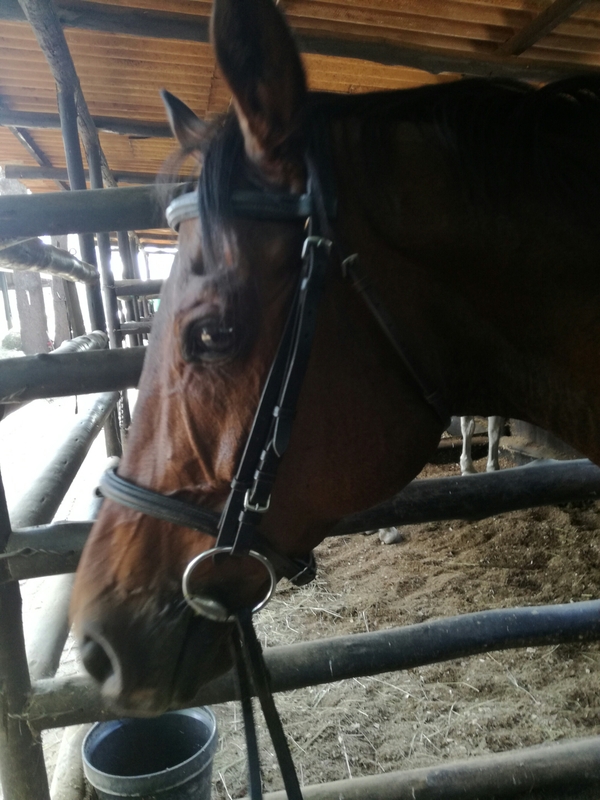 In the third session, I carried the dressage whip and gave her a touch as I asked the first few times just to make it clear we needed to canter on without kicking. By the end of this I had a much more powerful transition, using the hindlegs to spring up to canter. I do have to half halt on the curb rein to prevent the head from flying up. Old habits die hard. 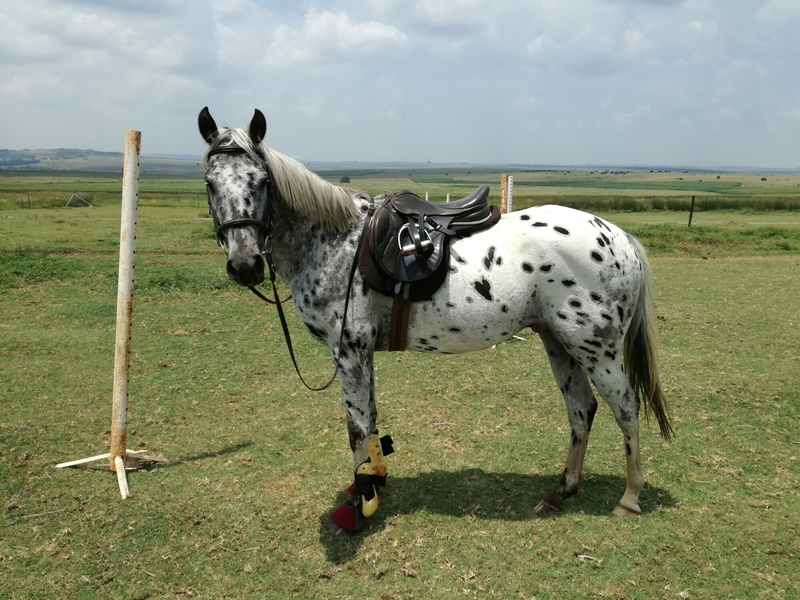 But the more connected I can keep her, the more engaged the transition, the more engaged the resulting canter. We went back to the medium-extended-medium walk and then canter exercise just once or twice and the difference was substantial. It’s still not going to be her best movement, but it’s an improvement. 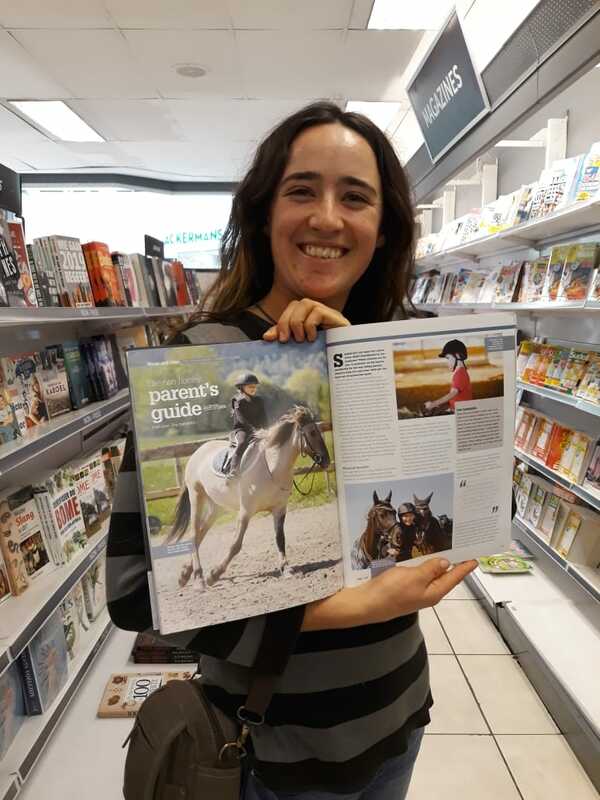 It’s not going to be brilliant until I can discipline my own body better in all the canter transitions and the canter itself, to stay tall (well, as tall as 5′ 4″ gets) and strong through my core instead of crumpling. Dancing with this dragon was exactly what I needed this week. How great is the God Who turns our worship of Him into His healing of us? … and I kinda forgot to write about it. 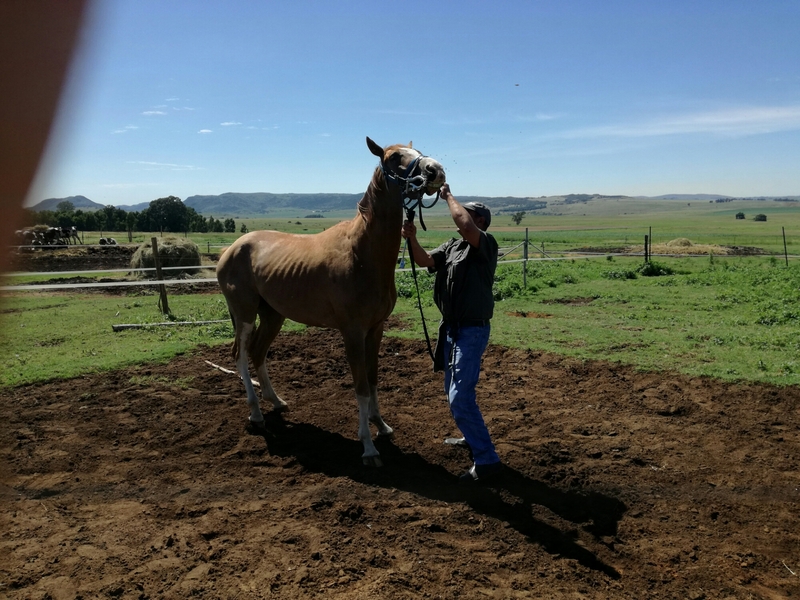 Two Sundays ago, a little spur-of-the-moment, we threw Vastrap and Jamaica into VT’s kid’s dad’s horsebox and went to Fourways. VT’s kid wanted practice for Finals, and I had to be there anyway so I figured I may as well ride. Jamaica had had the whole week off, so I sort of centered him around on the Friday and then popped through a simple gymnastic line that happened to be up on Saturday and off we went. He was so good about everything, too. 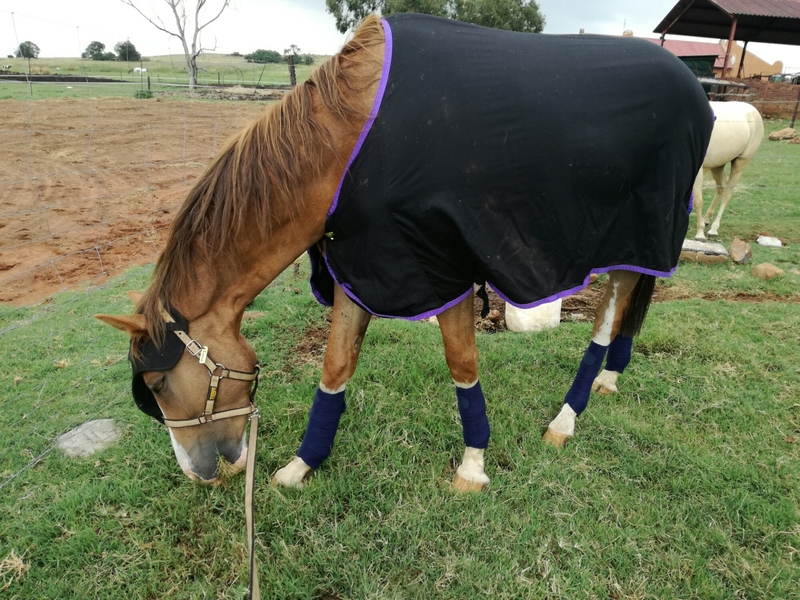 Good to box, got out and looked around and sort of shrugged indifferently, and when I threw him in a paddock and abandoned him, he merely smelt some poo and then ate hay. How cool is it to have a really easy, ordinary, uncomplicated horse? It’s a new experience for me and rather refreshing. Then VT and his kid promptly had a brilliant, blistering round in the 60cm, winning by streets. They got a bit flustered and had a pole in the 70cm, but it didn’t bother either of them much, so it didn’t bother me either. It was their first 70 this year and they’re only doing 60 at finals. Jamaica just totally showed up to work that day. He was calm, relaxed, focused and absolutely point-and-shoot. We went faster than usual, too, and cut all the turns in the 70cm speed for 5th in a class of 26. The 80cm didn’t even look big. He was careful and clear in the first round. In the jump-off he overjumped an oxer that really was rather big for the class and I took a second to get my act together on landing so we lost a few seconds making a squiggle to the next fence, but it was still good enough for 3rd out of 18. And I didn’t even hold the neck strap. God is way too good to me. Glory to the King. Yesterday I didn’t even realise what day it was until I discovered that, despite being as single as they come, I have a Valentine. 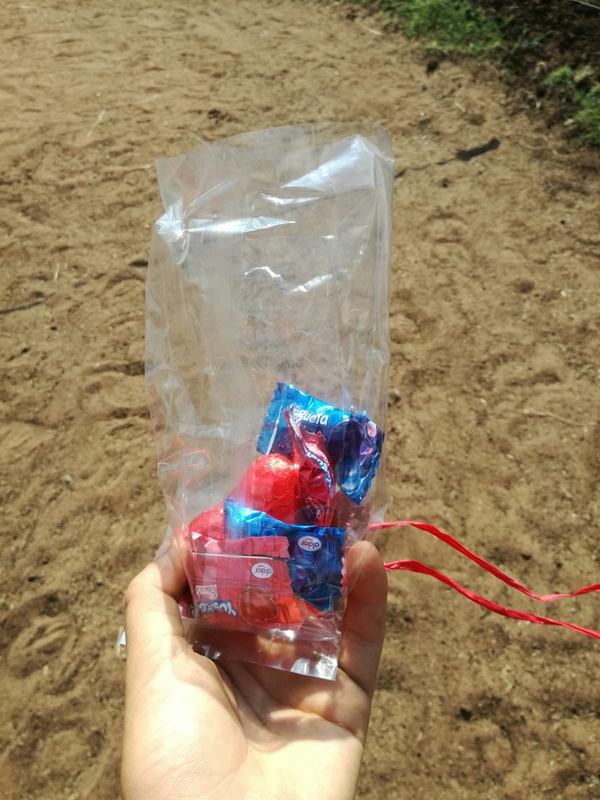 He is all of seven years old, but he brought me chocolate. Thus, he wins. On a more serious note, I was back at Winstead facing my demons. 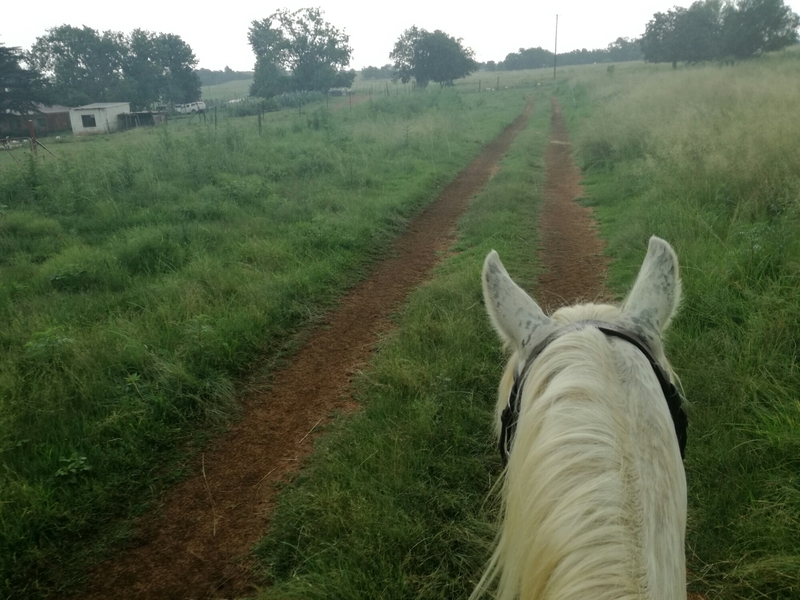 I really love being there, but I’ll be honest – I stood on the mounting block just staring at my steed for the day with a feeling of absolute helplessness for a few seconds. But I laid it down, and God came through for me. With the help of the wonderful Monty who is like a smaller version of Al who likes close spots (like me). 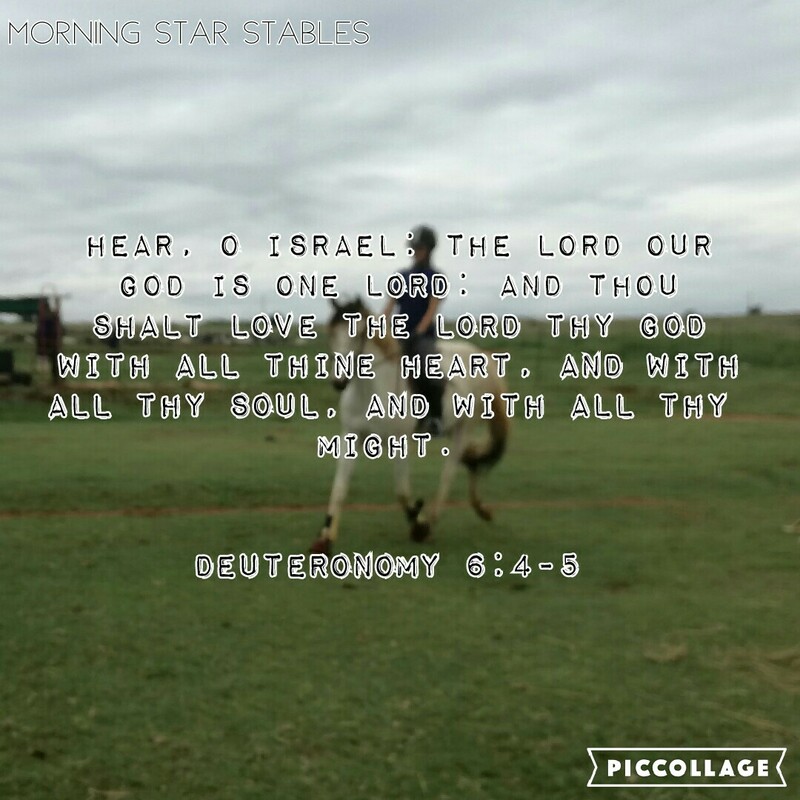 We had a fantastic lesson and jumped all the things with only one panicky recitation of Psalm 23. And just as I thought I was getting used to riding big horses, coach K put me on a creature that dwarfed the mere 16.2hh beasts I had been riding. Royale is the most incredible fancy comfy upper-level jumper thing, and I had a blast, but wow. He is big. I also got to ride Kardinal again and he got to show me how to do good canter-walk transitions approximately four million times, poor chap. 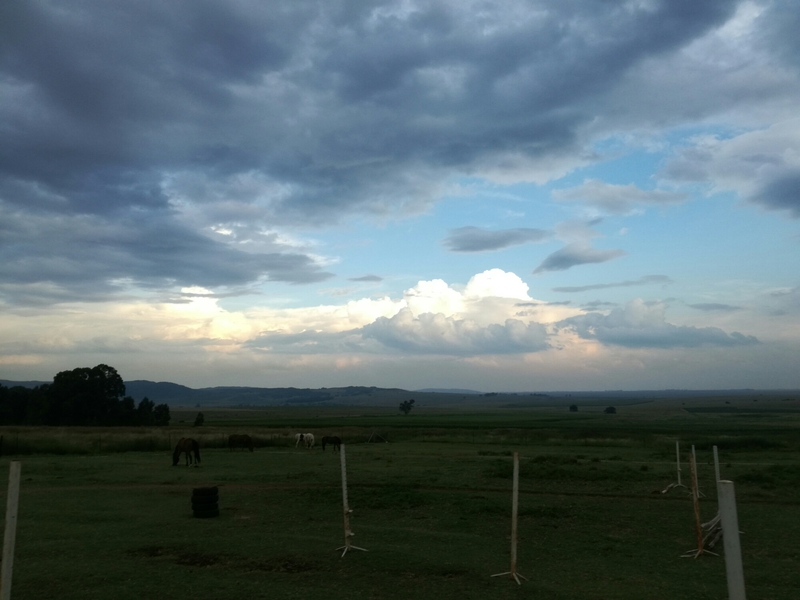 The day ended after some lovely lessons with an absolutely splendid sky to take our breath away. Today did not start off on as good a note when poor old Mutterer and head groom T ran out of fuel on the way here. We fed really late, but on the plus side I got a pretty picture of a view that I’ve seen so many times and never been able to photograph because I’m always driving. Once I finally got to start the riding, Arwen gave me the opportunity to unwind a bit by taking me for a stunning hack across the fields. She dragoned a bit and got quite hot and bouncy, but didn’t buck or go nuts. Destiny went beautifully today. He is firmly under saddle now and hasn’t been at all naughty, although he felt resistant today when I pushed for a more active walk. He gave me a happy little trot, though. Tara also schooled well; so chilled and rhythmic, but her turn right button occasionally seems to glitch. She’s not naughty, just keeps merrily going straight while you would really rather turn right. We had improvement by the end. I schooled Jamaica over a 75cm vertical, the biggest I’ve jumped him, with a ground line set the height of the fence away from the base. Neither Maica nor I are any good at seeing a distance and this exercise really helped. He also seemed impressed by the fence and didn’t take a single pole. I rode the same exercise on Starlight, just rather smaller. She has improved hugely under her mom’s schooling and has such a powerful little jump. Faithy and I went walkies, to her delight. Faithy adores walkies and pulls all the way out and all the way back. She’s spooky but super curious, and in her world, separation anxiety ain’t no thing. Midas, Sunè and Lancelot all had flatwork this afternoon and all did great. Midey feels so ready for HOY I can taste it. Sunè’s left turn doesn’t always happen gracefully in canter, but at least she’s got leads and connection now. And Lancey learns slowly (not for lack of intelligence, but for lack of attention), but he grasped lengthening his canter beautifully today. And now, bed. Glory to the King. Monday it rained all day and all night long in a steady, quiet deluge that soaked right down into the earth. After a day’s sunshine, we’ll be able to hear the grass growing. 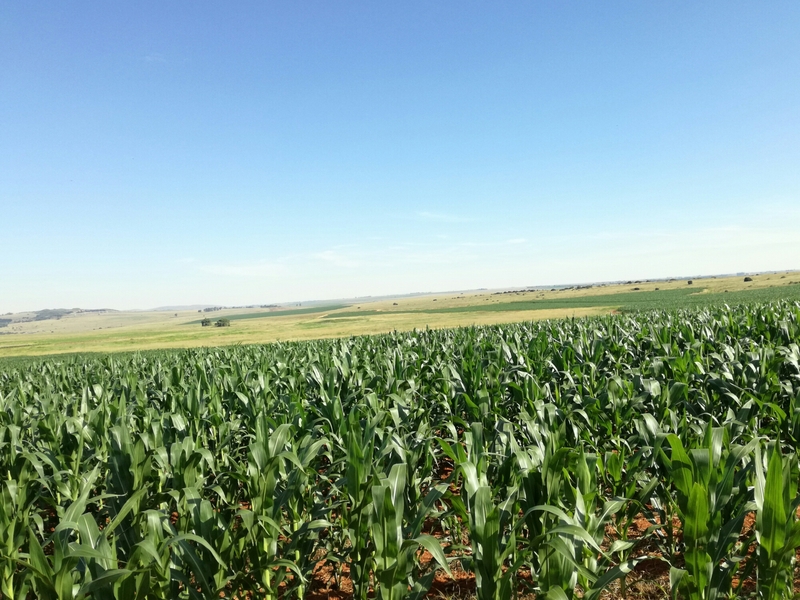 The fields were thrilled. The lunge ring, not so much. Even the grass arena, which is usually OK, was a mud bath. So this week became the Week of Hacking. 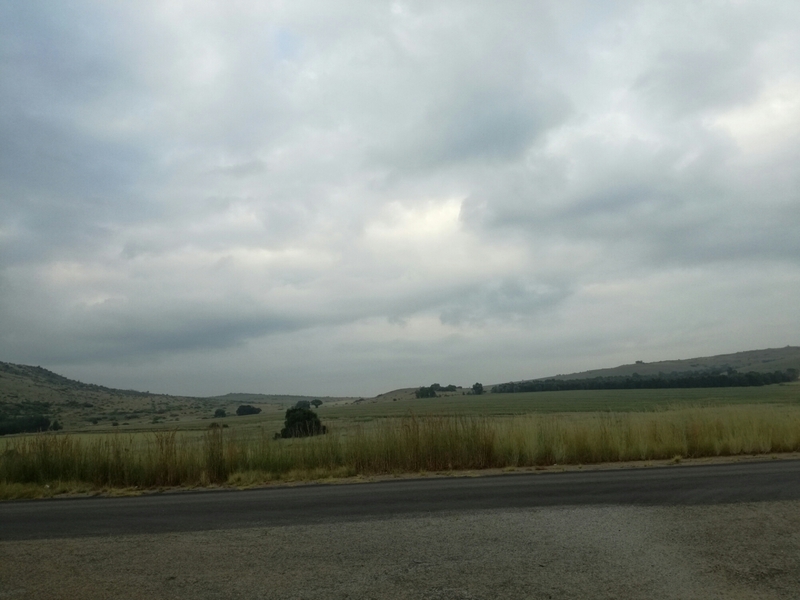 And with our beautiful Highveld in full summer splendour, I’m not complaining too loudly. Midas and Sunè deserved an easy week anyway, so I’ve only taken the two of them for hacks. Sunè has hacked before under head groom T, so it was no surprise when she was totally unbothered by anything. This appears to be Sunè’s MO. Midas was very bold and excited to be on a new adventure until the big Holstein heifers all came galloping over to see what he was. This was apparently terrifying, although I can’t blame him seeing how they’re bigger than him. To his credit he didn’t get out from under me or rear, but he was cantering on the spot in abject horror. Poor little chap. He dealt well with birds, dogs running in the grass and tall brush – just not cows, please. did I mention it was pouring rain? Jamaica has actually been working hard this week, particularly on jumping. 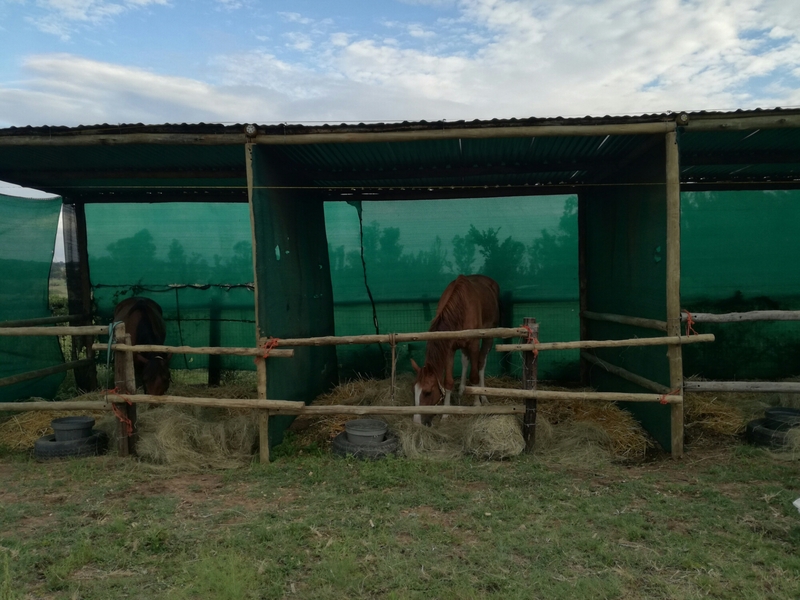 His flatwork is finally solid enough that we can really get over fences again, and he was being good but careless in front, so we built him a gymnastic line. He nearly fell on his face once, but this motivated him to start picking up his knees and he was jumping really nicely in the end. Lancelot got to jump the same gymnastic, which has been excellent for his confidence. 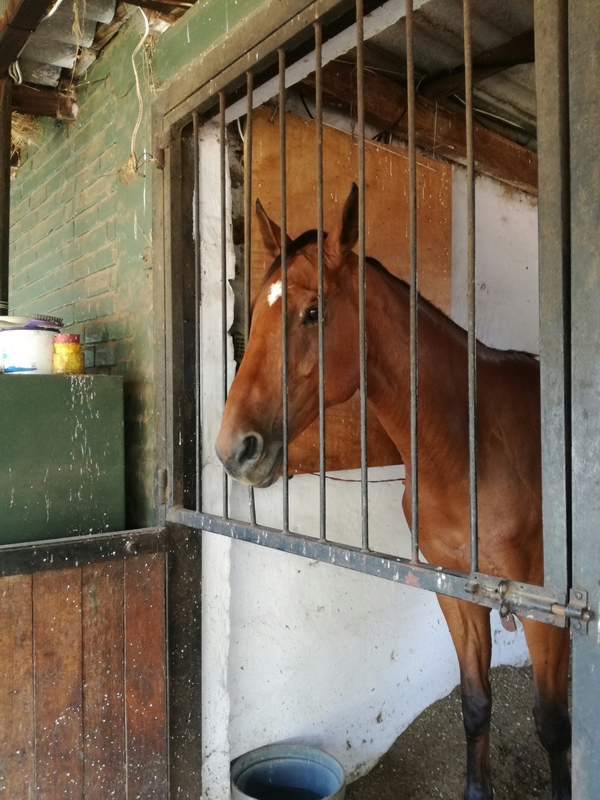 He is very careful but not yet confident cantering fences because he doesn’t know where to jump yet, but the gymnastic showed him where to put his feet and he was so good we picked the fences up to about 60cm and he didn’t bat an eye. Even with Z-kid aboard! Tara has been great this week, too. She doesn’t have a violent bone in her body. We’ve moved on to working in the big arena in walk and trot, adding a few steps of canter where we can. Zara was a little lame with a hoof abscess, but goes sound again now so I got back on board. I don’t think I long-lined her and Tara enough, and I’m regretting it now. Their mouths aren’t exactly hard, but responsiveness is being harder to get. It is improving though. We had walk and trot in the big arena as well, with minimal drama. Destiny progressed to the long lines and had one enormous violent tantrum before he remembered it doesn’t work on me and then decided to use his powers for good. He’s got a nice enough mouth when he listens, so I look forward to steady progress now that the worst of the resistance is past us. We also had a tremendous breakthrough with dear Nugget this week. It didn’t start out well when she decided to try and take a chunk out of my arm, whereupon almost by reflex I gave her one across the nose. I regretted it instantly, but as it turns out it was really not a bad thing. She instantly realised that I would not be walked all over but that I also wasn’t going to actually hurt her, and since then we’ve made huge progress. I have to feed her from my hand and go slowly, but I can catch her every morning and gently groom her main body and mane. And I managed to get her out of that ghastly old green halter and into something pink and cheerful. There is light in her eye again. She’s not going to give up on trying to find joy again, and neither am I. I get the feeling God’s got a high calling for this broken little horse if she’d only be brave. Exavior had his teeth done, for which he was quite a jerk but not malicious. We managed to remove the wolf tooth that had been causing so much drama and it’s so small you can barely even see it. The tooth is the teeny brown thing, the little speck you can hardly see. The rest of it is gum tissue that came out with it because he was plunging around like an idiot. Don’t plunge around for your teeth, idiot. The Mutterer will start to ride Xave for me next week, so I’ve just been lunging him. 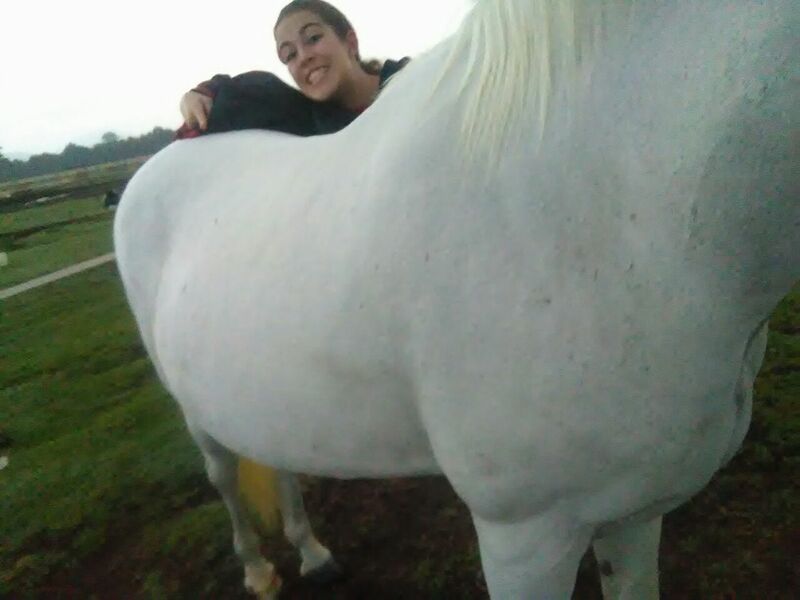 He’s angelic on the ground again, so God willing, soon I’ll be back on board that big, beautiful jerk of a horse. God’s got this. Glory to the King. Despite an ominous start on Friday evening, beginning with Exavior rearing repeatedly as I tried to bath him and ending at about 10:00pm after driving up and down and half the horses escaping their stables, Pre-HOY was amazing. I suspect it was amazing because it started so badly that I immediately realised I was not going to cope and gave the heavy burden to Somebody strong enough to carry it: my Daddy God. And He obviously did what He always does – miracles. 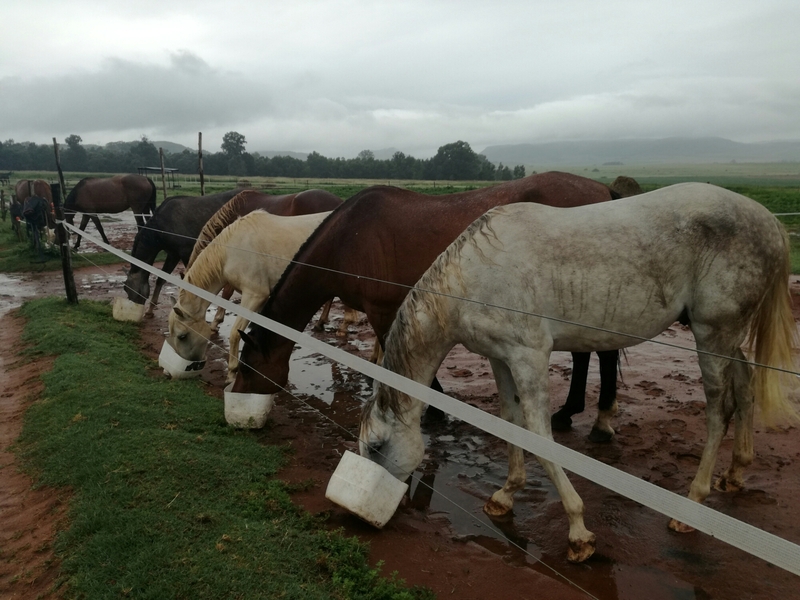 It rained all day Friday, so bathing them all was rather a problem. Mercifully, the pintos scratched, and we had a two-hour window that afternoon that enabled us to bath Vastrap and Midas and do something about Exavior’s grubby socks. At that point, the bays, Liana and Arwen were just going to have to cope. We boxed Midas, Exavior, Renè and Sunè up that evening. 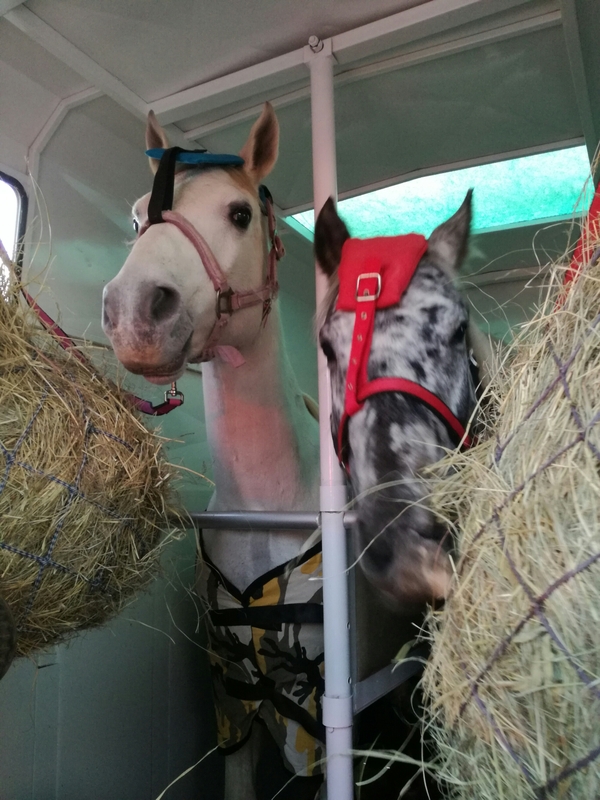 They behaved remarkably well and settled in nicely, so while we ran around sorting out our poor junior groom’s tent they were pretty much unobtrusive. The next morning, their good behaviour had run out. Renè, Sunè and Exavior were busy trying to climb into the resident horses’ stables to steal their breakfast and harrassing the resident grooms while Junior Groom stood shellshocked and stared at them and Midas shrieked with indignation, abandoned by his buddies but unable to climb out because he was too short. We stuffed them back inside and managed to keep them there while I scrubbed Sunè’s sock and got Xave plaited up. He behaved remarkably well and I began to think maybe my head wouldn’t be kicked in after all. Shortly thereafter, Dad arrived with Arwen, Liana, and Vastrap. VT had been turned out in a muddy field all night but miraculously he was positively glowing with cleanliness. 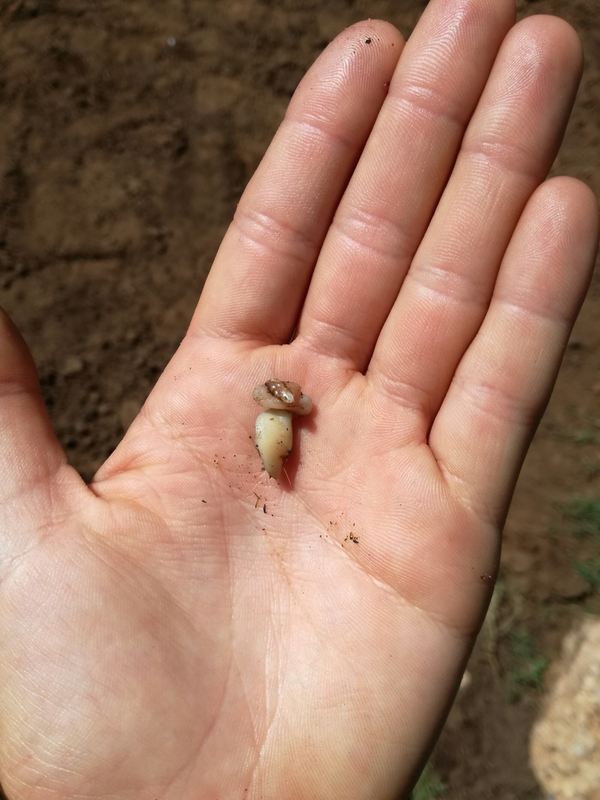 Small miracles. And with the turnout more or less done and everybody behaving great, off we went to compete. Exavior, despite my misgivings, was a superstar. I had a very long lead and a whip and a helmet and I didn’t need either of them because he didn’t even think of rearing. He was much too worried about his surroundings to sass his mother, so barring one huge spook, he was respectful and listened to what I said. Everything else in the class being like ten years old and fat, he came stone last, but I was just chuffed with how well behaved he was. Wherever this rollercoaster ride with him is headed, God is definitely steering. Next there was chaos as the in-hand for the Nooities had been combined, to my great consternation. My kids were on the ball and all marched in perfectly turned out and right on time. 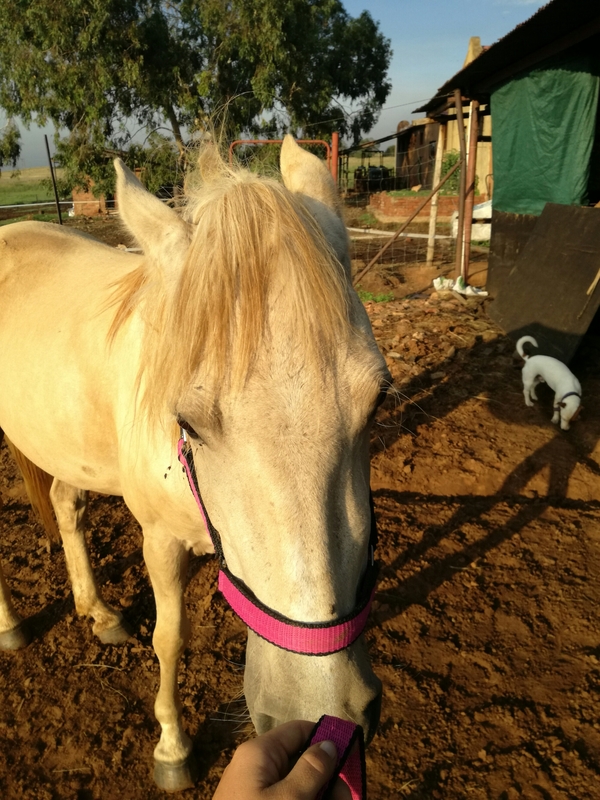 I arrived late, red-faced, breathless and having scratched Midas, with Sunè very wide-eyed on the end of the lead, her mane sticking up in all directions. I was a dishevelled mess. Sunè, however, was a trooper. She didn’t look at anything, she didn’t fidget, and she didn’t bat an eye at being shunted into a new arena with a panicking trainer. She was the youngest and most nondescript in the class so obviously the kids and their gorgeous ponies roundly kicked our butts, but I couldn’t be happier with her. Vastrap ended up coming second and going to supremes, with Liana and Renè third and fourth. (No, my mom is never going to let me hear the end of it). We went back up for show riding in convoy; Liana and her kid, Renè and yard rat K, and Midas and I. I expected Midas to be nutty because he hadn’t had a class to do in-hand or even get out of his stable all day, but he was phenomenal. Even better than Bruno was at his first show. He remembered his training, he focused, he didn’t spook, and when he got looky he just dealt with it and carried on. 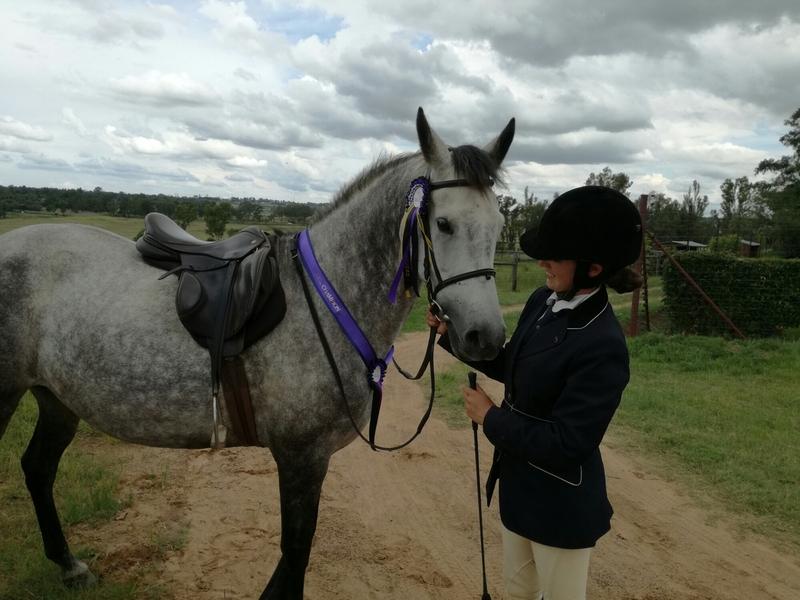 Liana’s kid was very nervous – real little perfectionist, so I sympathise – which made sensitive Liana very nervous too, but with the help of K’s mom they scraped it up off the floor and came a well-deserved second in the strong class. It takes a lot to pick yourself up like that. Renè and K were third, with Renè being completely relaxed and indifferent to everything despite it only being her second outing ever. Midas remained awesome despite having to do his simple changes in the middle of a giant puddle and he won the class, being the only one in the partbreds. In the enormous Supremes class he was shouting for his girlfriend and got a little strong when all like 30 of us were cantering around and circling and overtaking, but the second I asked him down to trot I got it. I was endlessly happy with him. Couldn’t have asked for better at a first show. 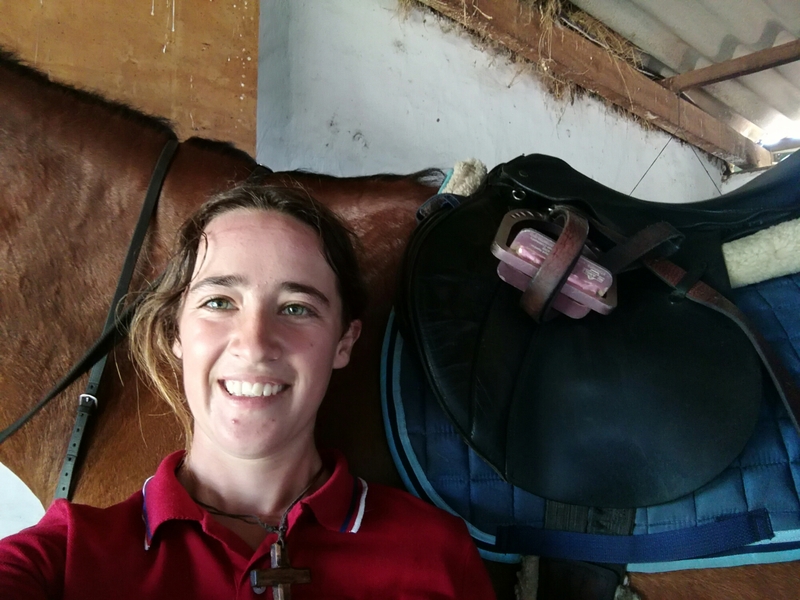 Show classes done and dusted, we moved on to the working classes in typical Morning Star Stables fashion; wildly excited riders, Arwen bucking and snorting because she hadn’t had time to warm up, and K running up wailing because her numnah had gone AWOL at a critical moment. In between the madness, Arwen jumped her working hunter round. Well, let’s just say it would have been a good showjumping round. 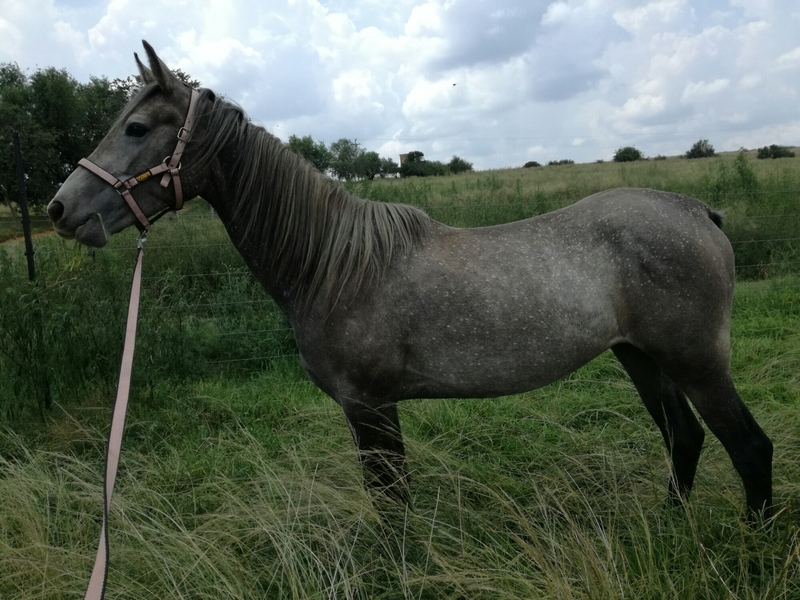 She galloped, sideways, at the fences snorting fire at them; I hung on somewhere in the clouds of smoke emanating from her nose, and she ate up every fence barring the down bank combination. There she had to stop and check how high it was before launching directly forward, almost leaving me behind. Our gallop was blinding but somehow I managed to get her down to a very quiet halt for the judges, who sat there and stared at us, aghast. We did not place well. I had the best time ever, and so did Arwen, who proceeded to merrily chomp on the grass beside the arena when I untacked her for the conformation. Working riding wrapped up the day with Arwen, Vastrap and his kid, and K and Renè. The course was fairly challenging; beginning with fairly scary raised trot poles, then a line of gigantic white umbrellas we had to weave through, followed by a barrel with a truly scary giant pink cow on it. The cow had to be picked up and carried at a canter the five strides or so to the next barrel. Then there was a highly spooky brush lane with a black rubber mat in it and a small jump made of straw bales. Last, we had to halt and dismount onto a wall of black boxes before leading our horses away. Renè was first of the Morning Star horses to go and did us very proud. There’s not a lot of horses that can do working riding at their second show, let alone with poise and composure. She turned up her nose at the poles, plopped happily around the umbrellas, and didn’t mind the lane, the jump or the wall. She did have a very good look at the scary pink cow, but K was patient and let her have a sniff and that was that. They didn’t manage to canter with the cow or I think they would have placed well. Vastrap coped beautifully with the difficult course. He actually trotted the trot poles this time, had a little look at the lane and took a minute to stand still by the wall, but his kid was glowing when they finished and he took great care of her. Arwen slept the whole time in the lineup, punctuating this by throwing her head and yawning massively. I was feeling my late night and in-hand classes, so I basically did the same, barely waking up enough to watch the kids go. When it was our turn I made a bleary effort to rouse Arwen for the trot poles, but she still clonked them roundly. Then we aimed for the umbrellas and suddenly she lit up. Dragons to kill! Certain she would spook, I kicked her; she broke to canter for half a stride and then I realised I had to basically just hang on and steer. So that’s what I did. It took all my effort to hold her down to trot for the lane and umbrellas because she was so excited and dragoning magnificently. The cow posed no problem; my steering did, and we overshot the barrel by half a stride, which we remedied by performing a perfect turn on the haunches. Of course, the jump and the wall did not pose any problem for this dragon. I’m not totally sure that working riding horses are supposed to get excited, but at least she wasn’t in the least spooky. 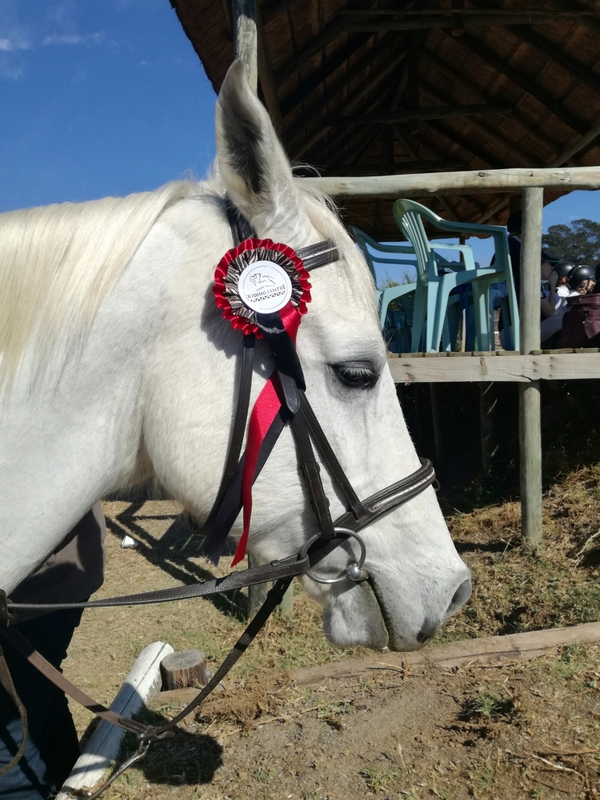 Apparently the judges enjoyed this new take on working riding, though, because beautiful Arwen was reserve interbreed champion in a strong class. I could almost pop. God so knows what He’s doing. I miss Nell, but she’s in a happy permanent home now. And now Arwen gets her chance to shine.